The on-going evolution of trainer-style sneakers has hit rock bottom with Gucci’s latest madness. In a recent issue of Harper’s Bazaar a Saks Fifth Avenue advertorial (that’s an advertisement styled to look like an editorial) there appeared a sneaker that has to be the worst accessory design ever. Form does not follow function for the gimmick-laden hot mess that makes absolutely no sense. The price of this nonsensical sneaker is certainly stupid $1,590! How low can fashion go? Gucci sneaker gone wild! Available at Saks Fifth Avenue for $1,590. I have just completed a new paper doll book concepted with Jenny Taliadoros for her Paper Studio Press publishing company. 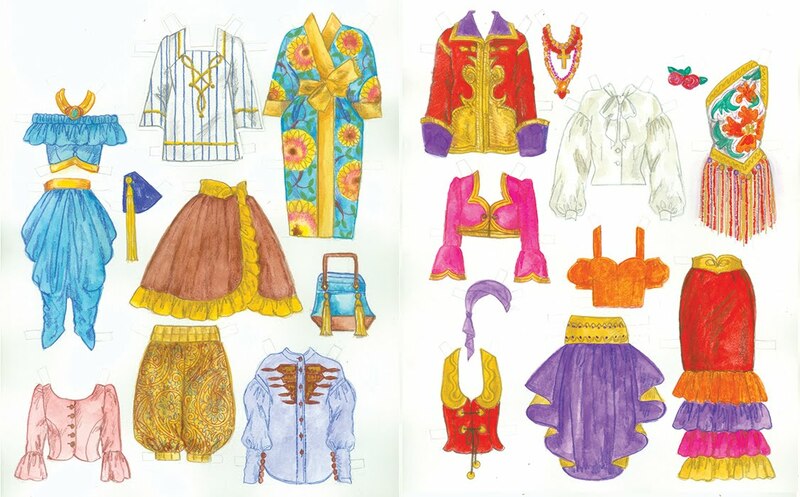 I was bemoaning the fact that I wish more collectors would actually cut-out and dress their paper dolls. 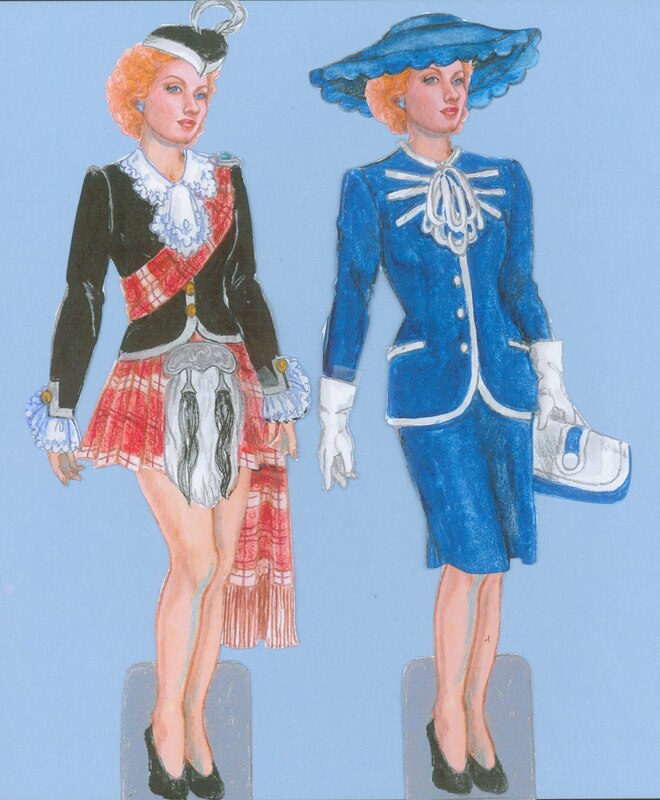 I think that many of today’s paper dolls are designed with already assembled head-to-toe outfits, often including a total look with layers, accessories, hair and hats already totally coordinated. Only the doll’s face peeks through a hole. What’s the fun in that? I remember the way I learned about fashion by mixing items and accessories and admiring the changeable results. 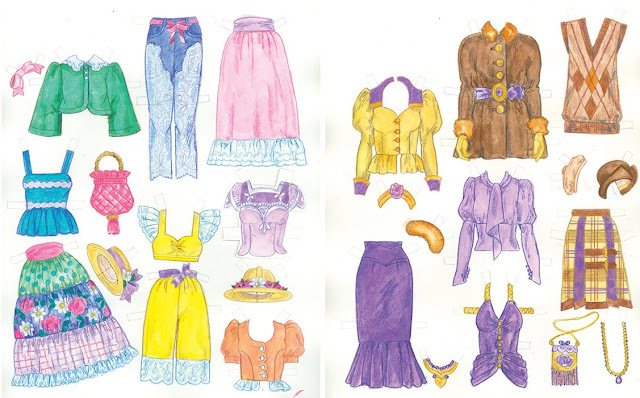 Jenny and I came up with the idea of creating a paper doll book with lots and lots of optional items that could be mixed and/or matched. 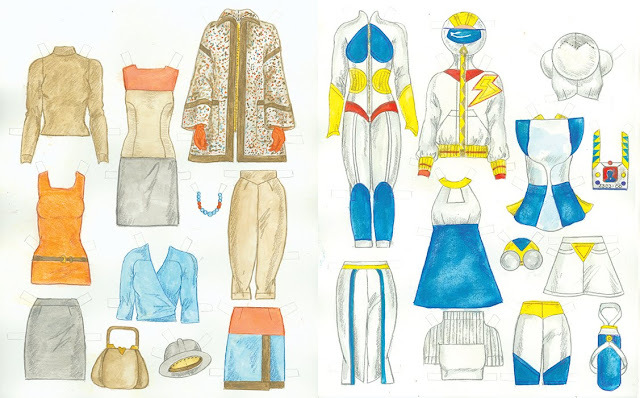 We decided to focus on eight timeless trends as the inspiration for the garment designs: Romantic, Sporty, Uniform, Exotic, Gypsy, Minimal, Futurism and Nostalgia. For each “trend” I designed approximately 10 to 12 pieces to put together within a trend or trends can be mixed-up to invent “new” trends. The book will be available late 2018 or early 2019. Front cover and back cover with three dolls that fit all the clothes. Romantic Trend and Nostalgic Trend. 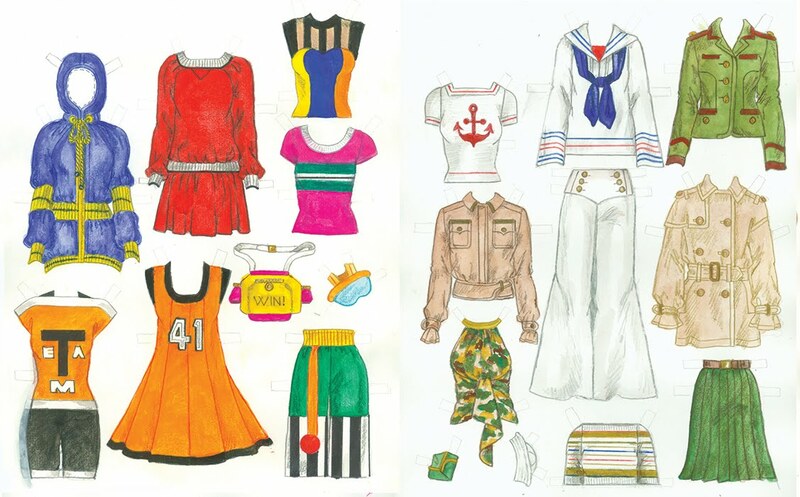 Sporty Trend and Uniform Trend. Exotic Trend and Gypsy Trend. Minimal Trend and Futuristic Trend. 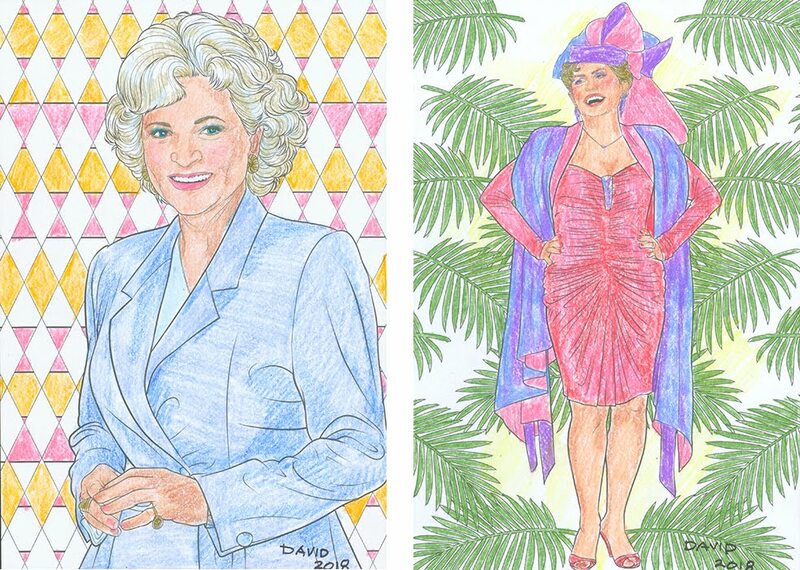 Coloring books continue their popularity and are now found in many stores and shops. I found a good selection at my local Michael’s arts and crafts emporium. I immediately snapped up a 100 page coloring book inspired by “The Golden Girls.” Half the pages feature the beloved characters from the long-running ABC TV sit-com; wise-cracking Dorothy, ditzy Rose, over-sexed Blanche and cynical Sofia. The rest of the pages are Florida-inspired prints and patterns, typical coloring book complex design meant to induce a Zen-like relaxation state. I don’t know about you, but when confronted with some busy little designs, I feel frustration rather than relaxation. Nevertheless, I persevered and colored a few pages. The Disney book, published by Kingswell, is available from Amazon.com for under $10. 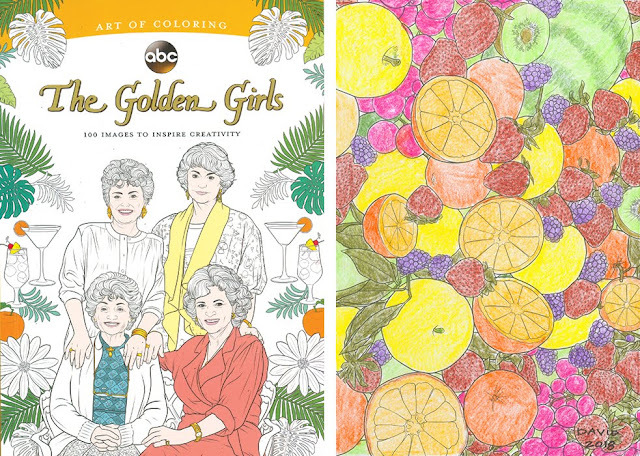 Coloring book cover and fruity Floridian pattern. Rose (my favorite character) and glamorous Blanche. For years, when I lived in New York, I attended a weekly life drawing session at a gallery in New York’s Soho art district. There, I met a charming, talented young man named Benjamin Frisch. We often chatted between sketches and he told me he is an editor of Slate, the trendy on-line magazine. He was very interested in the paper doll world and suggested that it might make a good podcast subject. I retired and moved to Palm Springs. A month or so ago, I reconnected with Ben and he arranged to record a long (3 hours!) long distance interview with me to use as the basis for a brilliantly researched investigation of the paper doll in history and today. The Decoder Ring podcasts, put out by Slate.com are billed as “cracking cultural mysteries” and that is precisely what Ben and editor Willa Paskin did. To my surprise Ben created a delightful paper doll of Me(!) to go with the interview. Click here to listen! 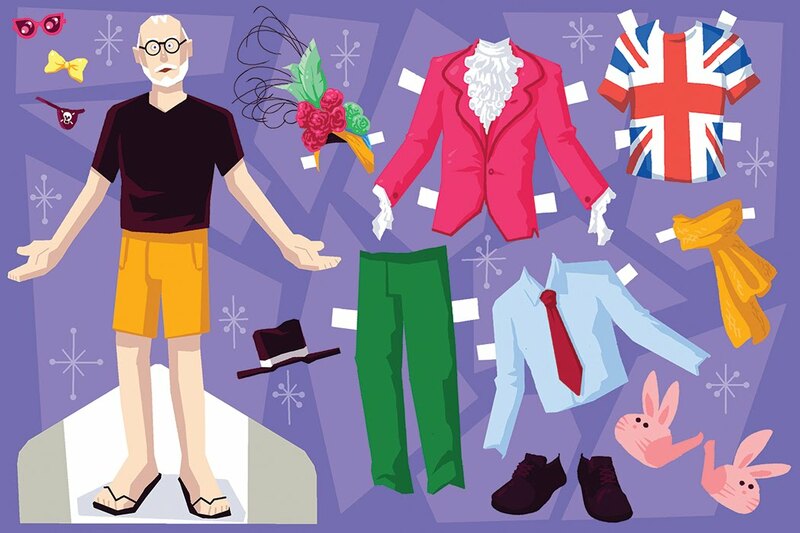 Paper doll of me! Created by Slate editor Benjamin Frisch. An upcoming issue of Paper Doll Studio, the OPDAG magazine is going to be themed to feature the United Kingdom. I lived and worked for two decades in London and Devon. Jenny asked me to write a bit of a memoir about my love of all things English. Being a dedicated Anglophile, it was a pleasure to gush lyrically about the UK of the ‘60s and ‘70s. To go with the memoir, I created a Greer Garson paper doll because she is the very essence of the gracious Englishwoman. I’ve done two outfits for the doll, costumes from Random Harvest. Fashion today is fascinated by collaborations, often unexpected or incongruous. A current collaboration put together young, super-trendy designer, Heron Preston with NASA. Yes, NASA, now celebrating its 60 year history. The familiar logo, worn from 1976 to 1992, is an iconic graphic element that recalls America on the brink of the Space Age. Heron Preston is not a genius designer and he has produced a surprisingly wearable collaborative collection of jackets, hoodies, polos, utility pants, accessories and a street savvy silver denim jeans jacket, all under strict NASA guidelines. Moon Mode for modern men and street savvy silver denim jacket. Commercial collaboration blends NASA with streetwise contemporary items. 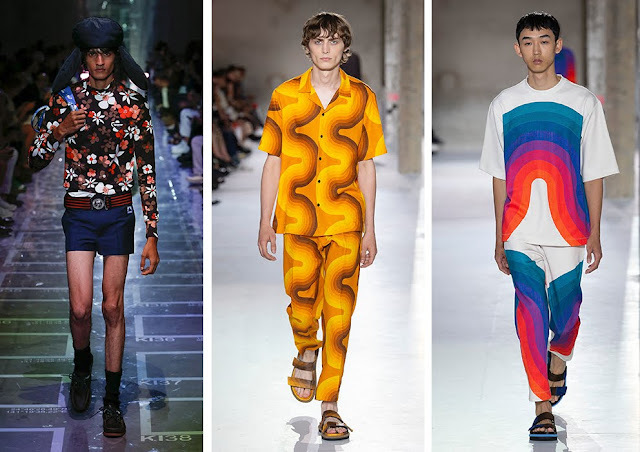 Now that the dust has settled after the hype generated by the recent Men’s Designer Spring ’19 Collections shows, it’s easier to spot the really meaningful styles by a handful of designers who are the true influencers. Gone are the extreme silhouettes, both super-skinny Thom Browne hangers-on and premature oversize boxy shapes. Both extremes are still there, but hardly noteworthy or immediately actionable. 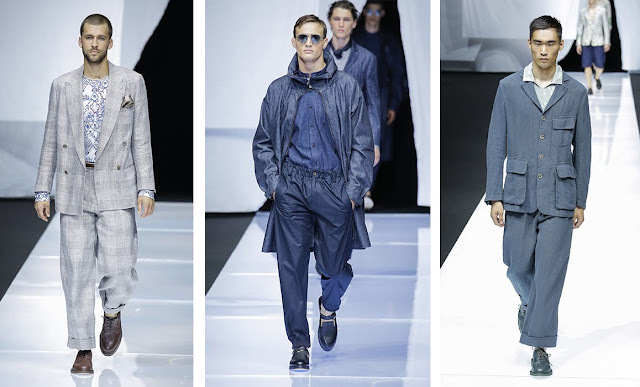 Leave it to venerable maestro Giorgio Armani to execute the best expression of modern tailoring that is big enough to be comfortable and flattering, perfectly relaxed for today’s style-conscious yet realistic male. Dries Van Noten’s dare-devil color caper was a courageous stand-out, a powerful, saturated palette. Prada usually is leader of the pack, but designer Miuccia Prada seems to be under the influence of Alessandro Michele of Gucci. Wild and crazy and a little bit silly. 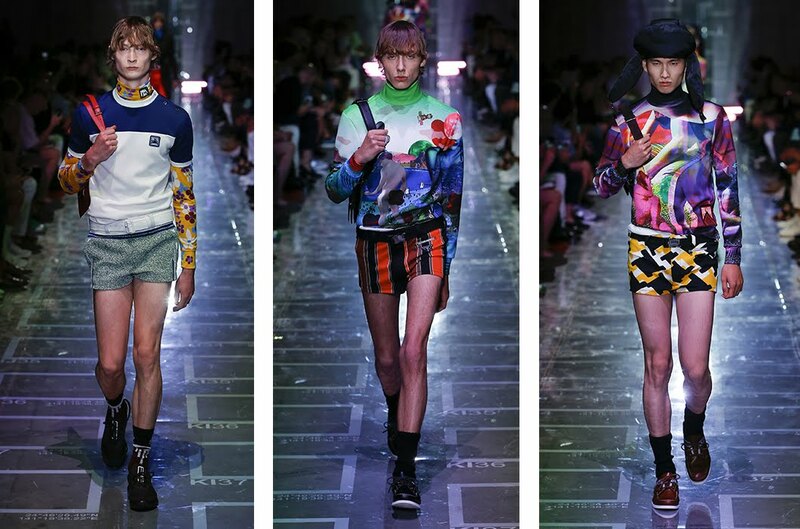 A fine line to walk, but Prada does it rather interestingly. The designing Caten twins Dsquared2 served up a reminder that there is still plenty of inspiration to be siphoned out of military uniformity and sporting style activewear. Oddly, both Prada and Dries Van Noten picked-up the mid-century Scandinavian graphics and optimistic color seen in the work of Danish interior designer Vernon Panton. This could be the start of something big! Giorgio Armani’s perfectly pitched, easily relaxed silhouette statement. Smart guy. 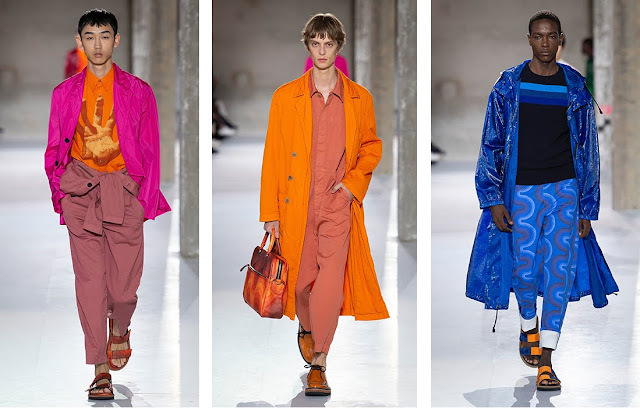 Dries Van Noten’s bold, brassy color caper. Prada’s daringly balanced tightrope walking. 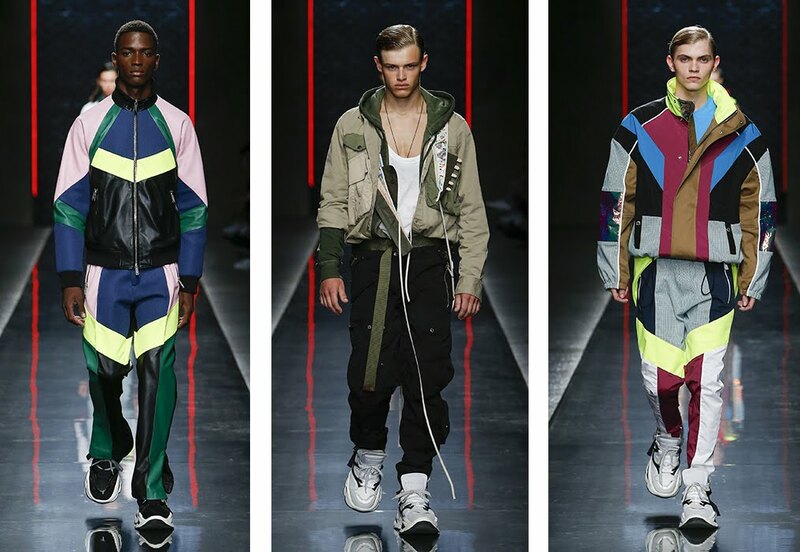 D-Squared offers new versions of military and activewear inspirations. Mid-century Scandinavian designer Vernon Panton influences Dries Van Noten and Prada.